The name comes from Captain James Cook, the first European to navigate the east coast of Australia, when he sailed here on 4 June in 1770. He was struck by the area's beauty and named the island after the day he thought it was - "Whit Sunday", the seventh Sunday after Easter, in the Christian calendar. It later turned out his calendar was wrong, it was not Whit Sunday, but the name has stuck. From looking around you can see many expensive yachts sailing about, the playground for Sydney's rich and Queensland's property developers. For those who are still saving for their own yacht, many different ferry companies operate from Airlie to bring people on day trips around the sights. A typical day trip might include a visit to Whitehaven beach, a trip to a part of reef for some snorkeling and a prepared lunch. Most islands do not have places to stay since they are protected national parks. But for the more adventurous an enormous choice of camping sites dot every island, where nobody else will come. Before tourism could make money, the Whitsundays were used for logging. Aboriginal people had traditionally used the trees here for timber, which might account for references in Captain Cook's diary about grasslands when he first came here. White settlers did the same after the Aboriginal population had dwindled away through European diseases and bloodshed. Nowadays, there is no visible trace of logging ever having happened in the Whitsundays (except for the old dam that was used by the sawmill on Sawmill Creek in Cid Harbour Whitsunday Island), although on Hook there are two clues of previous industry. One is that at the Nara inlet there are Aboriginal cave paintings. This can be accessed by boat, either on a private charter (bareboating) or on one of the backpacker sailing yachts who sometimes stop in. The second is that on Hook Island(and on some other islands) you may hear bleating in the forest. Goats were introduced by the colonialists so that shipwreck survivors could find food and later so that loggers could have something to hunt in the event that food ran out. Hamilton Island and Proserpine are the airports that service the region. Boats depart from adjacent to the airport at Hamilton to many of the Whitsunday Island resorts. Alternatively you can get the bus from Proserpine to Airlie Beach or Shute Harbour, and out to the islands from there. There are agents that will offer and price inclusive of this transfer. Even though it isn't that far off the Queensland coast, access by private boat isn't as simple as you may first think. Hamilton Island has many coral reefs near it and the tidal range is up to 4m. There is a marina (call in on Marine VHF radio Ch 68 or telephone 07 4946 8353) but prices start at about $17 per hour or $60 per day (5 June 2011). It makes stopping by for lunch at one of the many restaurants a bit less attractive when you can stop at one of the 73 other islands and pull up on the beach for free. Ocean Rafting . Fast and fun with high speed boats that can brave all conditions. This company actually caters for the island hopping day trippers, but can comfortably fit a few campers packs and water on board. The current price that they attempt to charge is $164, according to their brochure available in Airlie beach (note that the website quotes $180, possibly to get more money from an unknowing distance booker). This is technically their two day package for touring all around the islands, and should mean taking you to several different locations for snorkelling. If this does not interest you, there is no reason that they should not charge the normal day rate of $154, if you plan on going to one of the locations that they visit on their typical route (e.g. Whitehaven beach). The staff are super friendly, professional and efficient. They also charge you for a stinger suit (should you feel the need for one) and snorkelling equipment for free, but do not give you water, so you just need to sort it out in Airlie. The company has won adventure tourism awards in 2003 and 2004. Whitsunday Catamarans  Whitsunday catamarans is an advanced eco accredited sail and dive Company that operates from the Marina at Airlie Beach. Passengers join other like minded travelers on overnight tours around the Whitsunday Islands. Whitsunday Catamarans have two and three night tours available but all vessels should be booked in advance as many tours can booked out a few weeks ahead. Wings Diving Adventures  Wings Diving Adventures is an award winning sail and dive tour operator, with two boats in their fleet Wings and Emperor Wings. They offer guests the opportunity to sail and scuba dive on the Great Barrier Reef. Wings diving prides itself on being an eco certified tour operator with high standards of safety on all their vessels They offer guest fun live aboard cruises that will take them on 2 or 3 night adventure tours around the Whitsunday Islands and the Outer Great Barrier Reef. Their tours depart Airlie Beach 6 days a week. Whitsundays Sailing Adventures  Whitsundays Sailing Adventures currently offers scuba diving, sailing, sea kayaking and snorkeling tours in various parts of Whitsunday Islands. Diving boats are equipped with all the necessary tools to offer unlimited diving opportunities and various travel destinations are covered with tours available every day of the week. Booking in advance is necessary due to limited spots available. OzSail  OzSail Operates overnight sailing tours of the Whitsunday islands, Whitehaven Beach and fringing Great Barrier Reef. These Whitsundays Sailing tours are directly marketed at Backpackers and Students travelling around Australia, Prices start from $454 for a 2 day 2 night. Airlie Beach Backpackers  Offering many different sailing trips from tall ships to racing maxi yachts. Sailing Whitsundays  Whitsundays biggest selection of motor, sailing, crewed and bareboat vessels in the Whitsundays. Cruise Whitsundays  Takes you to many places and also a catamaran called Camira and a pontoon on the reef at Hardy Reef. Thundercat Whitsundays  Takes you to many places including an experience on the Great Barrier Reef. ZigZag Whitsundays  This Whitsundays Day Tour started in 2017 and has gained massive popularity with tourists and locals alike. Contributing reasons to this are down to the company doing things differently from the rest. Firstly the boat only takes 35 guests and has a massive 4 engines totalling 1200 horsepower, to combat the fast ride they have put large padded seats to make the ride very comfortable. Secondly, they are the only tour permitted to visit the exclusive Palm Bay Resort on Long Island, a fresh swim in the pool and a cold cocktail are the perfect way to end a day on the water. Thirdly they introduced dynamic pricing into the region, meaning if you book early you can save up to $60 per person! This Whitsundays Day Tour meets at Airlie Beach Abell Point Marina at 8 am and returns around 4 pm making it one of the longest tours available for a day trip. Tour summary - Visit Whitehaven Beach, 2 Snorkel Locations, Palm Bay Resort, Lunch snacks snorkel equipment and wetsuit are included in the price. Ticket pricing for this Airlie Beach Snorkeling and Whitehaven adventure start at $115 and as tickets sell out the price increases to a maximum of $175. Whitehaven Beach is by far the most recognized of all the Whitsundays landmarks. Stretching about 4.5km and consisting of fine, brilliant white sand, it presents the image that is used more often in tourism brochures and regularly on TV advertising in Australia. The view from the lookout across Hill inlet is remarkable and on a sunny day (Like most days are), it is nothing short of spectacular. The sand at Whitehaven Beach is 98% pure silica. The water lapping along the beach which is usually sheltered during the south easterly trade winds (Most of the year) and so the water where the sea meets the beach is often crystal clear and makes for perfect swimming. Hamilton Island is the most developed and populated Whitsunday island and has its own airport, post office and bank. It boasts some of the most valuable real estate in Australia, and has many options for accommodation, which range from standard hotel room to your own house! The most cost effective way of staying on the island is a house or apartment, especially for larger groups eg for weddings. There are many developments including unit complexes, the new Great Barrier Reef Yacht Club, the newest resort, the 6 star Qualia (on the island's northern tip) and the golf course and accommodations planned for Dent Island. High rise is on the island - the Reef View Hotel, Whitsunday Apartments and Yacht Harbour Towers are iconic. A bit 70's/80's in style from the outside, they are nevertheless testaments to the island founder Keith Williams' genius as the views from the upper rooms are stunning. Hamilton Island and Dent Island are privately owned by the Oatley family, founders of Rosemount Wines in Australia. The island is owned on a perpetual lease from the Commonwealth Government. Bob Oately bought the island from previous owners Banker's Trust, a publicly listed company. The island was founded in 1984 by Keith Williams, who also started Sea World, on the Gold Coast. In the 90's Keith went bankrupt due to complications with a pilot's strike and banking problems and the island was briefly taken over by Holiday Inn. There are regular ferry services from the mainland and other islands, but even though it isn't that far of the Queensland coast, access by private boat isn't as simple as you may first think. Hamilton Island has many coral reefs near it and the tidal range is 5.9m. There is a marina but prices start at about $17 per hour or $60 per day (5 June 2011). It makes stopping by for lunch at one of the many restruants a bit less attractive. The island's populated areas are loosely divided into three main areas - Marina Village (or Front Street) - this is where most of the shops and restaurants, the bank, the post office, the general store and the newsagency are located; Resort side - Catseye Beach, the main pools and the resort accommodations - Reef View Hotel, Whitsunday Apartments, Palm Terraces/Bungalows and the Beach Club are here; and the "northern end" where most of the apartments and houses are as well as the newest resort Qualia on the island's northern tip. None of these areas are more than 5-10 minutes by golf buggy (the main mode of transport) away from each other. Dent Island is west of Hamilton Island and is owned by the same owner as Hamilton under the same lease from the Commonwealth Government. It has been known in the past as Hamilton Island West. Currently mostly uninhabited, Hamilton Island owner Bob Oatley has completed building a Championship level 18 hole golf course on the island that also houses club house and restaurant. Day trips for lunch only are possible as are golf/dinner combinations. A shuttle boat runs to Dent Island from Hamilton Island marina approximately 10 times per day. Villa accommodation (private and resort sponsored) will be built there next. Whitsunday Island is the largest island in the archipelago, and home to the famous Whitehaven Beach. Most day boat trips come here and it is on most people's "must see" list of things while here. Whitehaven beach faces east towards the open sea, making some boat journeys there very choppy. The size of the island also means there are dozens and dozens of little coves and inlets where people with yachts or boats can pull in away from it all. Many boats also go to Tongue Point, which has a well trodden trail up to a built lookout over Whitehaven. Some of the boat packages on offer for first time visitors can have the feeling of a troop march for one camera shoot place to the next, so if doing daytripping, choose your boat company wisely. Whitehaven beach's main attraction is the pure white silica sand, along a seven kilometre (four or five mile) stretch. Sun glasses are essential (seriously!). Different theories about the sand exist, one of the more interesting that Australia's tectonic plates rubbed together and the silica oozed up from the Earth's, before being washed up here. Because of the sand's purity, it was almost mined by the American government in the 1960s for military uses. The substance can be used for satellite dishes. Luckily that did not come to pass, and the beach is now protected under the national park. Well over a hundred people dock here daily on tours, and it is always being voted one of the best beaches in the world, by the people who vote for these things. But between about 4PM and 10AM it is entirely deserted, for the intrepid few that camp overnight (or people who own yachts). There is a pit toilet behind the beach and no running water. Hook island is the second largest in the archipelago. The first maps of the area were drawn incorrectly, and depicted Hook island in the shape of... yes you guessed correct! In fact, Hook is shaped something like the Peloponnese in Greece, looking like three downward pointing fingers. Hook was home to a small resort on the very tip of the third finger, as well as an underwater observatory, leaving 95% of the island as national park but this resort closed in 2011. There is snorkeling in the bay in front of this closed resort, and a couple of different boat companies use this place as one to let the tourists see some coral. It is not the best, but there is also coral at neighbouring "Pebble beach" (which isn't pebbles but boulders) that is more extensive. One must however get the tides correct, so as not to be stranded when the tide drops, with the prospect of a very painful walk across the coral bed back to shore. Stinger suits (for poisonous jellyfish) should be used during the stinger season. The actual risk of a sting, and what the worn out stinger suit boat companies and resorts provide would do to protect you, is questionable. So if you bring a rash top you can minimise your worries (and look like less of a goof). Hayman Island  is beautiful and by far the most exclusive resort, the whole island privately owned. People without pre booked accommodation may not dock. Some of the most beautiful coral reefs are just off shore from here on the north west side of Hook Island. Long Island is mostly undeveloped save for three resorts. One is largish - the Mantra Resort in Happy Bay. The other two are smaller, more intimate "eco" style resorts - Palm Bay Hideaway and the very private (& expensive) Paradise Bay Wilderness Lodge. Lindeman Island is currently closed but undergoing a $250m renovation. The resorts should reopen sometime during 2016. Outrigger Cup. During June or July each year is the Outrigger Cup. Outrigging is a Hawaian sport using canoes with one "outrigger ama" to balance the boat on the ocean. During this week the action is mostly centred on Catseye Beach (on the resort side of the island) with 1, 2 and 6 person canoes competing over days in various events including short sprints and longer marathons, the most difficult being the Hamilton Cup marathon where the paddlers go right around Hamilton Island. For the fitter crews (Hawaii mens are particularly strong) this takes about 3 hours - that's hard paddling! The atmosphere is festive, the competition fierce and well known Australian Iron Woman Lisa Curry-Kenny is a regular competitor. Her Noosa team is a very strong competitor in the women's divisions. Hamilton Island Race Week. August sees the famous Race Week, started by Keith Williams in the 80's. This sees hundreds of yachts from 30 foot boats rented for the week to billion dollar super yachts finely tuned for serious racing. Famous yachts that regularly compete include Skandia, Alfa Romeo and one of the Wild Oats yachts - owned by the island's now owner Bob Oatley. Various classes of racing range from cruising division (despite the name some crews in this division are very competitive!) to IRC divisions for the yachting professionals. Race Week is when the island really comes alive with hundreds of sailors filling the marina and hotels, from the serious bustle of the mornings getting ready to race, the colourful spinnaker starts (on the last day various tourist boat operators take their vessels out with guests to watch the starts), to the sunburnt yachties straggling one and two boats at a time into the marina after a days racing to crack open a beer, put some music on and then head to the Marina Tavern for some hard "relaxing" after a day of hard racing. The night life is almost as important as the day's racing! Many Australian entertainers such as Jimmy Barnes have regularly perfomed at Race Weeks and there is live music every night from various performers. By far the most anticipated highlight is the Whitehaven Beach party - no-one wants to miss it! Only two divisions race over to Whitehaven but all the yachts go, along with the tour boats and ferries and barges. Bars and barbeques are set up on the beach and everyone plays beach cricket (during the 80's famous Australian cricketers would play on the beach. Famous Australians such as Elton Flatley and Lachlan Murdoch attend in recent times), throws a frisbee or a footy, plays volleyball and generally mucks around. Footwear not required, bikini or boardshorts, hat and sunnies essential.. Some island local girls plan their bikini outfit well in advance! There is a superb variety of choices for campsites on the Whitsunday islands for people who want to get away from all the pre-packaged tourism. Most of the Whitsunday Islands are protected National Parks but there are over 50 camp sites on the Whitsunday Islands that can easily be reached by private boat and are relatively inexpensive. To book a campsite online visit: ["Queensland National Parks"]. Those without their own boat can also participate by using the Whitsunday "scamper" service to take them to these camp sites: ["Whitsunday Scamper"]. You just need a pack for some food, some water and a tent and you are away. Or you can see more at Camping Whitsundays . The national parks of the Whitsundays also fall under the regulatory oversight of the Great Barrier Reef Marine Park Authority  (or GBRMPA for "short"). As detailed in the online brochure, campers are required to have sufficient water. The recommendation is five litres per person per day, and three days more for emergencies. In practice three or four litres a day will last people who are careful. So as not to be overcharged purchase the water or big containers to carry some at a petrol station or supermarket in Airlie. Another regulation, from the collective wisdom of the two authorities, is that boat companies need special permits in order to drop campers off on an island (even though someone with their own boat would need no permission!). Qualia on Hamilton island and Paradise Bay Eco Resort on Long Island will cost you as much, if not more than Hayman and all are unique experiences. 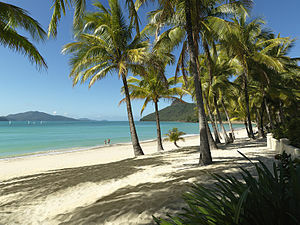 Hamilton Island Beach Club resort offers a more relaxing 5 star atmosphere with views of the Coral Sea. Prices start around $400/night. Cruise Whitsundays Reefsleep accommodation is situated on their pontoon at Hardy Reef, a floating pontoon on the Great Barrier Reef, 40 nautical miles from land. It provides one of the most unique accommodation experiences available in the country in swags under the stars. Overnight, only the staff are on location to look after you as all other guests have departed to the mainland, leaving you with exclusive use of the pontoon and its underwater viewing chamber. Overnight guests also get an alfresco dinner including wine, full breakfast, buffet lunches, sunset beverages, and two scuba dives or a guided snorkeling safari. This page was last edited on 27 January 2019, at 04:16.